EL SEGUNDO, Calif. — The role of defensive ace on the Los Angeles Lakers has been vacated since the team used the amnesty provision on Metta World Peace in the offseason. So with the best basketball player on the planet, LeBron James, in town Wednesday, who would have thought that second-round draft pick Ryan Kelly would be auditioning for the stopper spot by guarding James in the fourth quarter of a close game against the Miami Heat? [+] Enlarge “I was like, ‘I got to find a way to stop him.’ Didn’t. But that’s a learning experience and something to grow on, and I’ll watch the film and see what I could have done different,” Kelly said after practice Thursday. OK, maybe it’s being a tad facetious to suggest Kelly would go from bench warmer and errand-running rookie to the all-defensive team, but even if he didn’t have much success against James, he suddenly finds himself part of the Lakers’ rotation. Kelly had played only 23 minutes all season in five spot appearances when D’Antoni called for him to sub into the first quarter of the Lakers’ road game against the Phoenix Suns on Monday. Kelly didn’t hesitate when D’Antoni called for him to come in with 1:29 to go in the opening period against the Suns, taking less than a minute of game time to score a 14-foot step-back jump shot with 33.4 seconds left. The 6-foot-11 Kelly is just as eager to shoot, even if he’s coming in cold. In the seven games Kelly has played this season, he has made one shot in five of them, even though the most shots he has taken in any game is only four. He prepares by simulating his potential game opportunities in practice. Kelly played nine minutes against Phoenix and a season-high 17 against Miami, contributing four points (hitting his only 3-point attempt), one rebound and one assist. While his stats have been meager, there appears to be room for growth with Pau Gasol (upper respiratory infection) probably out of the lineup Friday in Utah and D’Antoni staying committed to keeping a floor-spacer on the court to open up driving lanes for his guards. It all has been remarkable progress so far for Kelly, who was selected No. 48 in the NBA draft out of Duke University in June and went on to miss all of summer league and half of training camp because of lingering foot issues yet still showed enough to make the team. Then when he wasn’t getting playing time with the Lakers, he embraced a couple of D-League assignments with the L.A. D-Fenders, boosting his confidence by averaging 25.2 points, 7.6 rebounds and 3.8 assists in five games. While he is still trying to carve out a consistent role and gain his teammates’ trust — there was a play against Miami when Kelly was wide open in the right corner, but Nick Young looked him off and passed to Xavier Henry who was defended on the wing instead — he has proven himself to a certain extent already. 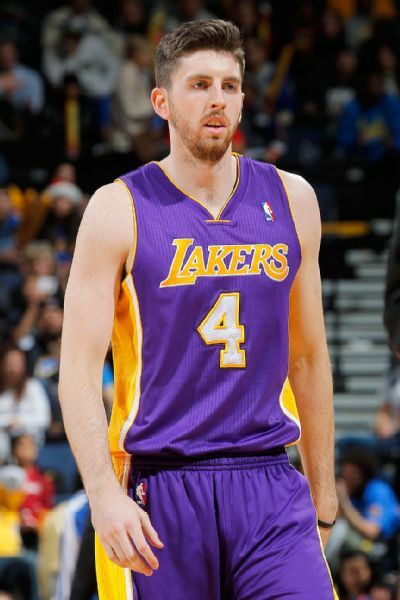 “Kelly can play,” guard Jordan Farmar said. “He’s a great rookie. He waits his turn, he works really hard and when he gets an opportunity he’ll be ready for it. We all have confidence in his ability and what he does on the practice floor when we do get a chance to get out here. He can help us. He stretches the floor, but he can also make plays. Kelly is hoping he can make it work long enough until his $490,180 rookie minimum deal becomes fully vested shortly after the new year.